These bearings are designed to facilitate the removal and replacement of the bearing element without disturbing the shaft alignment. After removing the cap the bearing element can be replaced, and the cap bolted down. 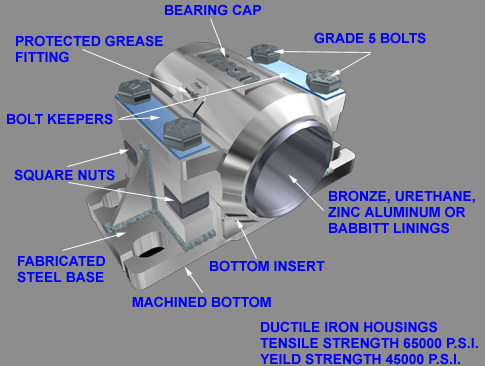 The bearing elements are available in Babbitt, Urethane, Zinc Aluminum and Bronze Bushed, and are interchangeable. Grade 5 bolts are used, and are prevented from turning loose by the use of keeper plates under the bolt head. Square nuts are located in recesses and are locked in place. Grease fittings are at 45 degrees and are countersunk into cap to prevent damage. Overall dimensions are the same as the conventional 1400 series bearings with the possible exception of 5 7/16 and 6 7/16 sizes. Overall height of the 2500 series bearing is less than other standard split bearings, but the bearing still maintains the same base to center height as the 1400 series. All caps have 1/2” deep gib. The bearings have ductile iron housings and fabricated steel bases. To ensure rigidity, bases can be welded down after the shaft has been aligned and the bolts tightened down, thus eliminating the need for keeper bars. If feet are to be removed from the base, a saw should be used and not a torch. Fabricated Steel Base – this becomes the permanent fixture onto which replacement cartridges are installed. Ductile Iron Cap (top) and insert (bottom) are available with fully interchangeable bushings made from: Babbitt, Urethane, Bronze or ZA (zinc-aluminum). When replacement is required, roll-out shells are provided for all bore sizes. Log Decks, Log Stops and Unloaders, Hour-Glass Rolls, Kickers, Debarkers, etc. Low profile design allows bearings to be used and quickly serviced in difficult-to-reach locations. Urethane – recommended for shock load applications – contains 2% molybdenum and graphite, allowing use on shafts running at up to 80 RPM without lubrication. But lubrication is recommended for extended life. Za or Bronze – recommended for heavy radial loads: note – Za has better wear resistant properties than type 660 bronze at a much lower cost. May be used in any application that calls for 1300, 1400 or 1500 series bearings (some dimensions may differ). Anson will custom manufacture bearings to suit your applications. Call 1-800-663-7723. Having bearing problems? Anson Sales of Delta, British Columbia thinks it has the answer to some of those problems. Anson’s 2500 Series unit has a horizontal split with a gib. It is a three-part bearing and can be supplied with babbit, polyurethane, bronze or zinc aluminum lining. The zinc aluminum lining is being used as an alternative to SAE 660 bronze, giving a similar service life as bronze at a much reduced cost, according to Anson. The zinc aluminum is poured “in house,” thus ensuring fast service. The most popular lining used in the Anson bearing is the polyurethane, which has an excellent “memory” and readily absorbs impact and shock loading, says Anson. The unit utilizes a split ductile iron housing and fabricated steel base. Anson’s revolutionary roll-out shell design offers the user the quickest and simplest bearing replacement in the market today. The four bolts on the cap portion are removed and the cap pops off; remove two keys and the old roll-out shell; roll the new shell in and replace the keys and cap. The entire replacement is accomplished without disturbing the shaft assembly and alignment. They’ll also interchange with regular bearings of the same dimensions and can be welded down where there is lots of vibration. Ken Porter, Boise Cascade, Mount St. Helen’s, Oregon, says Boise uses Anson’s 2500 Series urethane bearings in hourglass rolls, drag conveyors, log hauls and log kickers. They are mounted horizontally or vertically. Other Anson products are the 1000 Series, one-piece bearing block, and the ATU Series all steel fabricated conveyor or take-up frames, 40 degree angle split bearing and flange bearing with roll out shell. Over 100 mills across North America can attest to this innovative 3-piece split sleeve bearing. 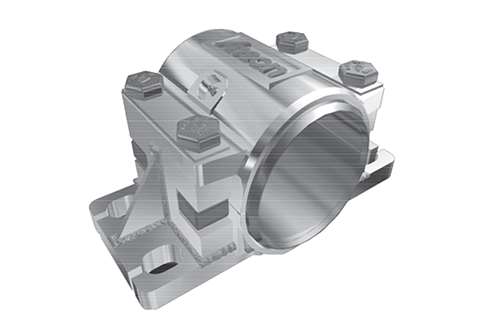 Babbitt, Urethane, Zinc Aluminum and Bronze Bushed castings are interchangeable. Base made of fabricated steel and may be welded down to maintain shaft alignment. This becomes the permanent fixture onto which housings are installed. Unbolt top cap of bearing. The bottom half (insert) can be replaced by jacking up shaft, push out bottom half, and replace with new insert. The drive chain and deck chains remain in place during the change. Alignment of the shaft is maintained throughout the replacement operation. When shock loads are involved, as with stop unloaders, kickers & bumpers, urethane should be used because of its excellent memory. The urethane contains 2% moly and graphite, and can be used on shafts running up to 85 RPM without lubrication. On heavy radial loads, Za or Bronze should be used (Za 12 wears better than 660 Bronze at a reduced cost). On all bore size and larger all that is required for replacement is a set of roll-out shells. The only bearing to use around log decks, log stops, hourglass rolls, kickers, etc. or wherever bearings are difficult to reach. BORE A B C D E F G H L S T U V Y Z WT. All sizes equipped with roll out liners. AVAILABLE IN BABBITT, URETHANE, ZINC ALUMINUM, & BRONZE BUSHED, ALL INTERCHANGEABLE.